A little while ago, I wrote a post on the Wild Eye blog about how difficult I found it to photograph the vastness and multitudes of the Great Migration in a way that would communicate it properly to people who would only have the chance to view my photographs and not experience the phenomenon for themselves. This is another photo I captured during an amazing afternoon of driving through hundreds of thousands of White-bearded Gnu (with some Plains Zebra thrown in) over the rolling hills of the Mara Triangle in Kenya. With so many animals succumbing to the waters of the Mara river, the stampede of their herd-members or the plethora of predators prowling the plains, the vultures of that ecosystem just sit around and bide their time while the next meal is being dished up. 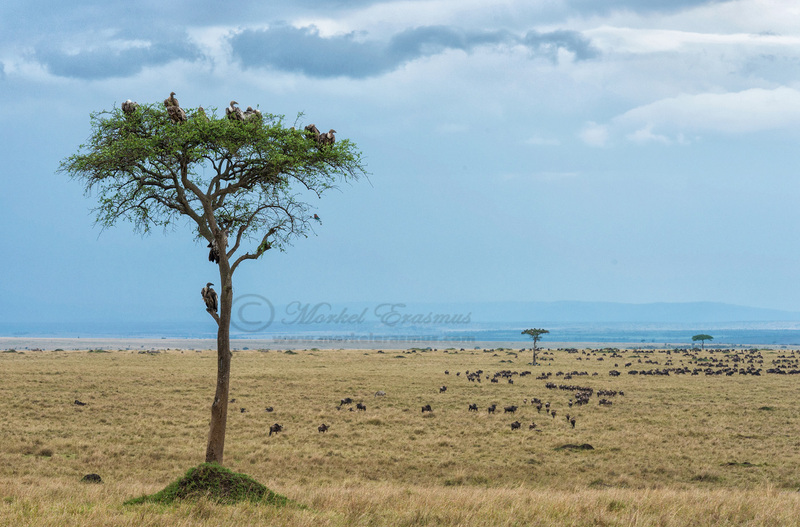 I tried to capture a tree that had quite a few of them roosting in it, combined with the trekking herds over the hills. This is the result - well, one of them. This one needs to be viewed larger - so I am posting an image larger than what I normally post. This one is 1400 pixels wide so do click on it to view properly. What do you think of it? Does it give you a sense of being there? Thanks for viewing! Have a great day! It is stunning - just looking at this just makes me want to do the trip! My only comment I would like to make, can you move your watermark down to the bottom right in the grass, it would still be seen? ?